Is every creative act a form of biography? Does everything we elect to do with purpose and care paint a portrait of us in miniature? And what about those things we do spontaneously with little care? Perhaps even carelessly? Might they actually be the most accurate indicators of who we are – even when we can’t see it ourselves? And then there’s the stuff that comes to us uninvited? Dreams, imaginings, visions. Is that biography as well? One of my earliest memories is of a dream. A merchant steamship is moving slowly through thick, silvery fog at dawn or evening twilight. A time that could be any time. The captain steps out of the wheelhouse and leans against a railing looking out into the mist, listening. A lit cigar is pinched between the first and second fingers of his left hand. Smoke drifts from a cylindrical ash at the tip. With the unconscious ease of a maneuver performed a thousand times, the captain brings the cigar to his lips, takes a puff, then grasps it between his thumb and index finger. He flicks briskly with his middle finger and I fall away from the glowing ember. At first I drift on a misty breeze. Then I’m bobbing on the sea, but only for an instant as I feel myself dissolve into the vastness of the ocean, becoming one with it. I love the memory of that dream, and it may have predisposed me from a very early age to associate tobacco with transformation because I love tobacco too. I don’t smoke often. Perhaps one pipe full or a cigar every six weeks or so. This is intentional so that each experience is intense and approached with sweet anticipation. Colors are more vivid. The edges of objects more distinct, as if outlined – an especially exciting effect when looking at something detailed and dynamic like the swaying bough of a tree. My visual depth of field expands so that items both near and far appear in the same plane and in focus. And I’m filled with contentment and a sense of optimism. As the last puff swirls away and is gone a nostalgia embraces me, like a vacationer saying goodbye to Venice or some other extraordinary place. I used to know a marvelous fellow named Fred. He was the proprietor of an antiquarian bookshop in Hollywood. For a couple of years I tried to visit him at least once a week, usually on Friday, for conversation and to pore over his recent acquisitions. Most of the books I prize are those he found for me. We had many things in common, including an appreciation of pipe tobacco. One evening we were sitting together on the roof of his apartment building. Literally sitting on the surface of the roof with our backs against the southern parapet so that we were facing the Hollywood Hills while we smoked. The sun had just set, but the sky still held a magical Southern California summer evening glow. Suddenly we were on our feet. “I see green disks,” I shouted. 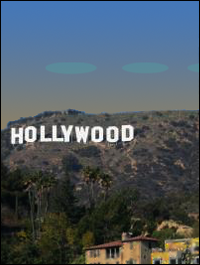 “I see five,” I told him, never taking my eyes off the line of green, saucer-shaped objects moving slowly westward over Hollywood. “That’s what I see too, but I only see four,” Fred insisted. We walked along the northern edge of the roof describing to each other what we were seeing. The details were identical except for the number of flying objects. At the instant that we reached the corner of the roof, the green disks changed course and began moving south. We stood watching and describing what we were seeing until they were out of sight. This is another cherished memory. Vivid and sweet with the giddy mystery of something entirely unexpected. That part of me that wants to be surprised…that wants to have to rethink everything I thought I already knew…loves to remember Fred and me standing on a rooftop, amazed and gawking at a spectacle in the heavens. At the same time, I’m possessed of a theory regarding what might have taken place. Imagine, if you will, two guys contemplatively smoking their pipes at twilight. Something happens. Something just slightly outside the center of their vision. A super bright flash of some sort. Perhaps an arch light coming on in front of a theater a little north of them, then instantly flaring out. The light bounces off a row of windows on a high rise building and reaches their eyes in an identical linear pattern. Except perhaps that some object obstructs one observer’s view just slightly so that he sees one fewer elements than his companion. So intense is the flash, and so wide open are their tobacco-loosened pupils, that they get temporary retinal burns that register as green disks slightly left of center in their vision. And as off-center retinal burns will do, they move away as the two amazed onlookers attempt to examine them more closely…right to left until they are gone. I like that hypothesis almost as much as I cherish the memory of the unlikely experience. Another time, I was sitting by myself at the beach smoking a pipe. The sun had set. The wind was up and I was cold. My senses were maxed out. I was feeling so much that I was feeling nothing in particular. Before me the sea and sky were identical gray, demarcated by a slightly darker seam horizontal across my entire range of vision. Suddenly the horizon split. It opened so that the sky above and the sea below were separated and there was a plane between large enough for me to pass through. And I did. For what seemed a joyous eternity I moved over the water and under the sky toward something marvelous that I experienced as a meeting with a beautiful, extraordinary person. I was again in that in between place. Flying blissfully over the sea and under the sky. But I was also at the dinner table, aware that I was motionless and quiet, staring at a women I hardly knew, who gazed back with a gentle smile. “What’s going on?” Don asked. “He’s in a trance,” Pam explained. Pam’s smile broadened a little, “He will.” And indeed I was once again simply sitting at the table with my wife and our guests. After you’ve lived with someone for a bunch of years, whether you’ve consciously thought about it or not, you come to think you know them. So you can imagine my amazement to see and hear a stranger communicating through my wife’s body. Her name was Lisa Cunningham, a young English woman who sailed for New England in the 17th Century with her coreligionists seeking refuge from persecution. She had a distinctive, soft voice and quiet humor, and most memorable was a gesture she made with her hands when she was excited. Her fingers moved quickly and precisely along the edges of an invisible rectangular collar. I happened to be present during the session in which Lisa described her own death. She had waited as long as she could for her husband to return, but there was nothing for it but to see if she could make it to the home of their nearest neighbor. She fell asleep in the snow. For an account of strange doings on the fringe in Renaissance Rome check out Cellini Courts Demons in the Coliseum. This entry was posted in Discussion, Participation Mystique, Reflections and tagged benvenuto cellini, dreams, flying saucers, Hollywood, hypnotism, Memories, past life regressions, tobacco by thrum. Bookmark the permalink. i must say, when it started out with the concept of a dream, i hesitated…. i LOVE to tell people my dreams, i don’t particularly like hearing others: a classic scenario i imagine. but, as per usual, your experiences and then your excellent story telling never cease to amaze me. i hang every word. and i am forever fascinated by the many lives you and carol have lived that i get to discover…bit by bit. thank you. We miss you guys too! It is darn dreary in the old hood without you! Your experience, and its similarity of tone to the declaration I heard during one of my wife’s past life regressions, suggests to me that impatience and testiness may be unavoidable components of personality in whatever form it is manifest. If so it may have something to do with a distressing sensation of lost time in relation to sequential experience. Perhaps personality in all its manifestations is discomforted by willful repetition. Sort of like, “I’m standing still! Something must be wrong!” Or like, “I’ve been here before…why can’t I escape? !” (Somewhere Sartre is muttering, “Old news, old news.”) Your questions cause me to think how fortunate the child is who has the opportunity to work through unlikely assertions unencumbered by boilerplate explanations. I think the questions you ask are urgent and vital, especially as cruel orthodoxy seems perpetually in bloom. Many thanks for sharing! Love this particular post. What a ripping yarn, actually a chain of ripping yarns. You somehow manage to relate so many disparate and beautiful images. Thanks for sharing that dream too. I feel like I learned something from this post. I approach sharing dreams with a lot of hesitation ‘cause it seems to me it all too often happens that a dream is shared with the intention of conveying one thing, but actually broadcasts a wide array of other stuff that might best have been left unsaid. That certainly could have happened here as well and I just can’t see it. So I’m much relieved to hear that your reading of the dream registered in the “of value” range. Many thanks for your comment! i felt that way too, lori. the chain of ripping yarns AND the learning of something/something/something.